SO this week, there was a story doing rounds about “Kenyans abroad given one year to disclose income to Kenya Revenue Authority or face stiff penalties“. I didn’t give it much thought until I got it from four different people. Now my question is, as a Kenyan in Germany, should I even care about it? So here’s what I found out. First of all, KRA did issue Guidelines on Foreign Incomes but did not take the time to issue a statement on who they are referring to or how those mentioned can do it the right way when there’s no amnesty. So I set out to find out, how all this affects my coins…..below the commentary are links to the resources and a summary of them. Let me start by stating that I’m neither a lawyer nor an accountant, just a tax payer worried about having to pay taxes twice. Any lawyers, tax experts or financial experts, feel free to correct anything that is wrongly stated. I recently visited KRA offices and below are some updates. I’m sure you’ll be as shocked as I am to find out that ALL Kenyans are required to file tax returns regardless of their place of residence. This came into effect in 2001. 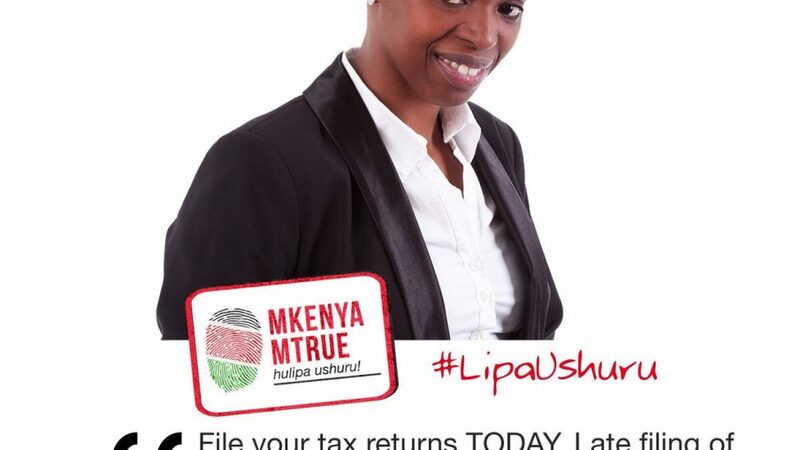 Needless to say, I have never filed a tax return in Kenya ever. This year will be the first. This is a requirement even if you have no income. Surprise surprise, that you pay a fine if you don’t file your taxes. Even if you have zero income and therefore zero tax returns, you should still file or face paying a fine. KRA has also increased the fine from KSh. 1,000 to KSh. 20,000. Luckily, Kenya and Germany have a Double Taxation Agreement that saves all of us from having to pay taxes twice. 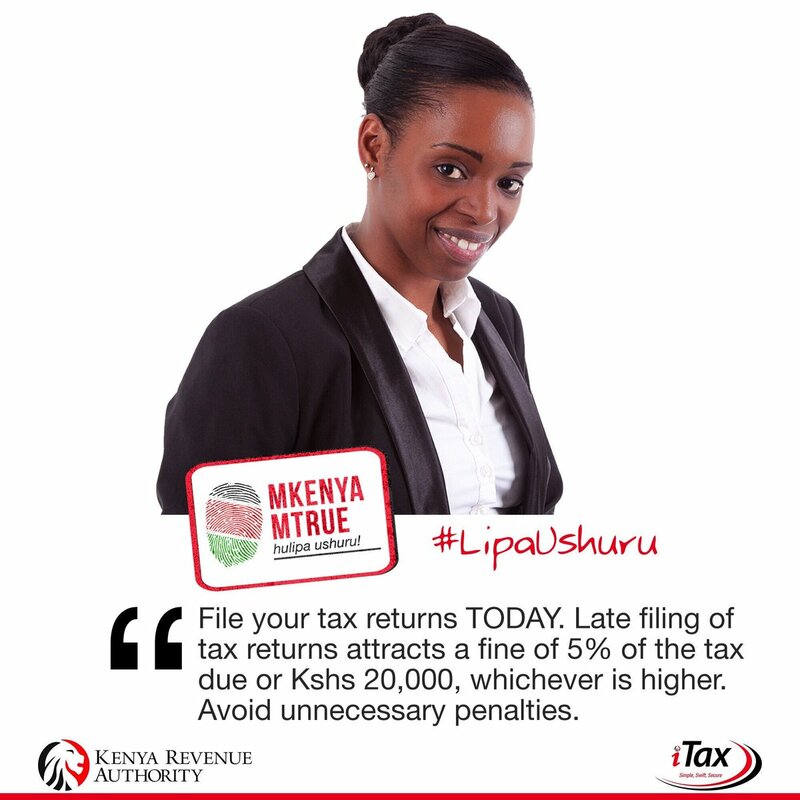 This however does NOT save you from filing tax returns in Kenya. You will not pay taxes twice, BUT you have to file in Kenya. In Germany, filing your taxes (Steuererklärung) is optional. 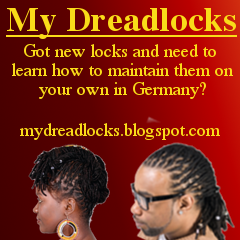 As a resident of Germany, your income may only be taxed in Germany. You may however have to pay taxes in Kenya, if you work in Kenya for more than 183 days within a year and/or if your income was coming from a company in Kenya. If you own shares, bonds etc, you need to pay the taxes in the country where the shares are in. In Kenya, the tax from dividends is deducted even before you see the dividends, so that should not worry you. Any money you make from property can only be taxed in the country the property is in e.g. if you have a rental apartment in Germany, then you are taxed in Germany. The same applies to Kenya. For those of us with a kamburoti in Kitengela, this needs to be in your tax return to KRA. This is regardless of your citizenship status. For those of us doing shipping businesses, you only need to pay taxes (to run your company) in the country you collect items from, of course custom duty might apply in the country where you deliver items, but the company should not incur additional taxes e.g. VAT. For the musicians, scientists, artists visiting Germany for a period of less that 183 days in a year, from Kenya then you need to pay taxes to Kenya. Those who plan to stay longer, then your taxes should be paid in Germany. 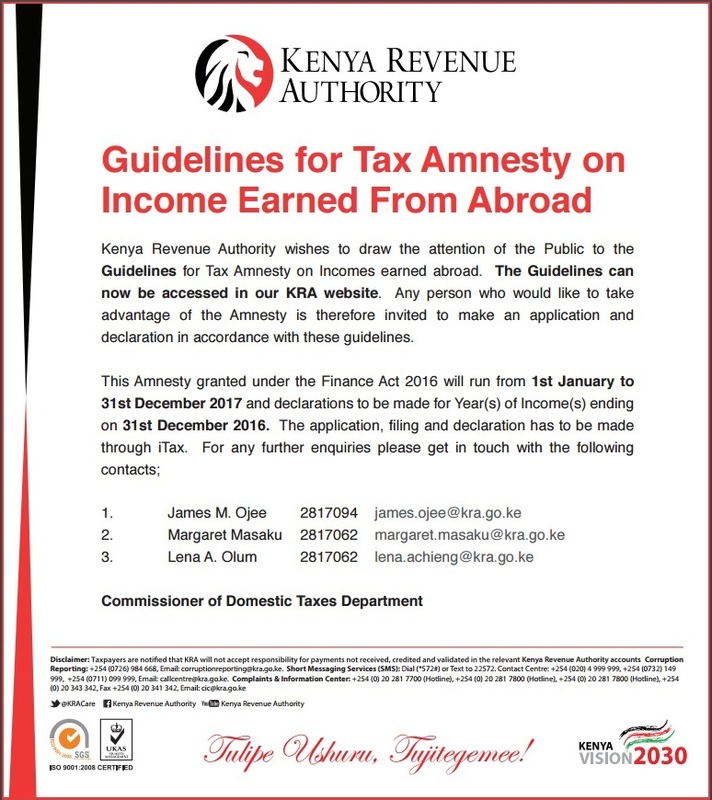 There’s basically nothing to worry about if you have been filing your returns, but if you haven’t this is a good time to check out the Guidelines for that Amnesty and from now henceforth to always download the forms from the KRA website here for your tax returns. If you have never filed tax returns (this applies to everyone with property in Kenya, even German citizens), the amnesty will allow you to get back on par with your taxes if you have any and if you don’t, to start filing that nil return. Take advantage of it, if not, KRA will come after you. File your tax returns this year, even if you file a nil return. Have it done. If you’re unable to do it, or would prefer to have a professional do it, then appoint a trustee to do that for you in Kenya. Just make sure your PIN from KRA is clear and you remain compliant, we wouldn’t want you to get arrested after landing at JKIA for being non-compliant or end up serving a tax evasion sentence when you had planned to enjoy some Nyamchom back home. 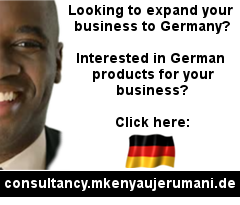 For Kenyans living in Germany, there is a Double Tax Agreement between the two countries that was signed in May 1977 and came into force in 1980, you can find here and here or also here if you want to read it in German/English. 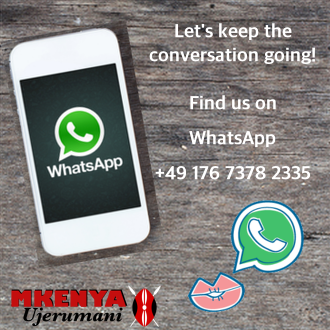 For Kenyans in other diasporas, you can find the agreements or at least their status here and here. Also referenced above is the Income Tax Act, which you can find here. 11. (1) Not later than two months after the end of each year, a person shall render to the Commissioner a statement and declaration in the form that the Commissioner may provide or authorize in respect of each person to whom payment is made at any time during the year, showing such particulars as the Commissioner may require. 47. (1) The income of a non-resident person shall be assessed on, and the tax thereon charged on, that person either in his name or in the name of his trustee, guardian, curator or committee, or of any attorney, factor, agent, receiver or manager. (The profits of an entreprise of a contracting state shall be taxable only in that State unless the enterprise carries on business in the other contracting state through a permanent establishment situated therein. If the entreprise carries on business as aforesaid, the profits of th entreprise may be taxed in the other state but only so much of them as is attributed to that permanent establishment. Dividends paid by a company which is a resident of a contracting state to a resident of the other contracting state may be taxed in that other state unless the dividends are excluded from the basis upon which German tax is imposed according to paragraph (2) (a) of Article 23. The provisions of paragraphs (1), (2), and (3) shall not apply if the recipient of the dividends, being a resident of a contracting state, has in the other contracting state of which the company paying the dividends is a resident, a permanent establishment with which the holding by virtue of which the dividends are paid is effectively connected. In such a case the provisions of Article 7 shall apply. Where a company which is a resident of a contracting state derives profits or income from the other contracting state, that other state may not impose any tax on the dividends paid by the company to persons who are not residents of that other state, or subject the company’s undistributed profits consist wholly of partly of profits or income arising in the other state. However, such interest may be taxed in the contracting state in which it arises and according to the laws of that state, but the tax so charged shall not exceed 15 per cent of the gross amount of the interest. he is present in the other contracting state for the purpose of performing his activities for a period or periods exceeding in the aggregate of 183 days in the calendar years concerned, in which case so much of the income may be taxed in that other state as is attributable to the activities performed in that other state. Subject to the provisions of Articles 16, 17, 18, 19 and 20 salaries, wages and other similar Renumeration derived by a resident of a contracting state in respect of an employment shall be taxable only in that state unless the employment is exercised in the other contracting state. If the employment is so exercised, such renumeration as is derived therefrom may be taxed in that other state.